We Play A Cheetos Ad Masquerading As A Game : Wait Wait ... Don't Tell Me! For this week's Mindless Arcade Friday, we play a Cheetos ad masquerading as a game. 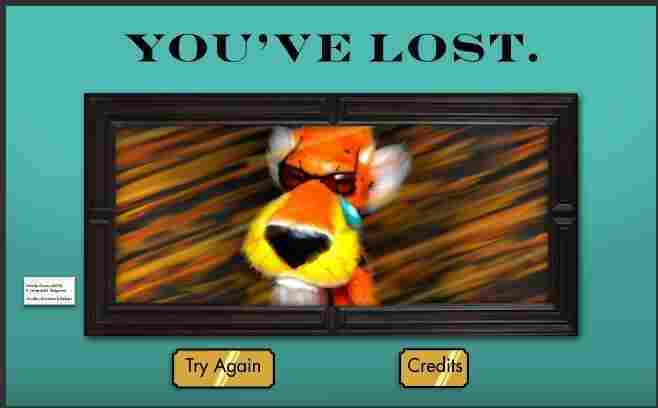 Paint-by-Cheetos is possibly the easiest online game ever. It is also the most Cheeto-focused game ever. Today's Game: Paint-By-Cheetos by Cheetos and HeroInteractive. Some online games are free for utilitarian reasons, others are free because they are advertisements. Paint-By-Cheetos is the second kind. But a free game is a free game! Also, I love Cheetos. Gameplay: To play this game you hold down your left mouse button and smother an object in simulated cheese dust. You are given several seconds to do this, which ends up being way too much time. You will win this game. If you don't, then maybe computers are not for you. Recommended, for people who like: Cheetos, barely concealed advertising, the color orange, cheese dust, things that are in no way a challenge. * This game is probably the first game since Final Fantasy VII that requires you to smother a pair of animated dentures with animated Cheeto dust.